Behlman Announces a Higher Level of Communication and Remote Programming Options for Some of Its P-SeriesAC Power Sources / Frequency Converters. With 8 models and numerous options, Behlman P-Series AC Power Supplies can meet the need for reliable, clean, controllable power, for virtually any purpose, worldwide. The Behlman PF1352 provides clean power with microprocessor control. It has a vacuum fluorescent display and fully adjustable voltage and frequency. Our goal is to expand the utility of our very popular USA models, so that engineers and technicians everywhere can perform their mission-critical and essential industrial tasks more readily, with ultimate reliability. Behlman Electronics, Inc., known for its leadership in providing power products for military, industrial, and commercial applications worldwide, has introduced a new, high-performance interface to three of its P-Series AC Power Sources. Called Option U, this high-performance interface includes USB, Ethernet, and RS-232 Interface using SCPI protocol. This option enables faster communication speed, programming the power supply remotely from greater distances, and compatibility with newer computers. Behlman’s Option U high-performance interface is available on their Models P1352, P2002, and PF1352. The PF1352 is power factor corrected, and carries the CE Mark essential for users in member states of the EU and EFTA, including Iceland, Norway, Switzerland and Liechtenstein, plus Turkey. Model PF1352 is perhaps the most versatile in Behlman’s line of P-Series AC Power Sources. It provides PFC input, fully adjustable voltage and frequency, low-output THD, unique overload protection, high-efficiency, excellent line and load regulation. Remote programming via standard RS232, and now, with Option U, remote programming via RS232/USB/Ethernet or, using Option 1 IEEEE-488. Its CE Mark is evidence of its worldwide capabilities. Like all units in Behlman’s P-Series, it can be used on a table top, or mounted in a 19” rack. 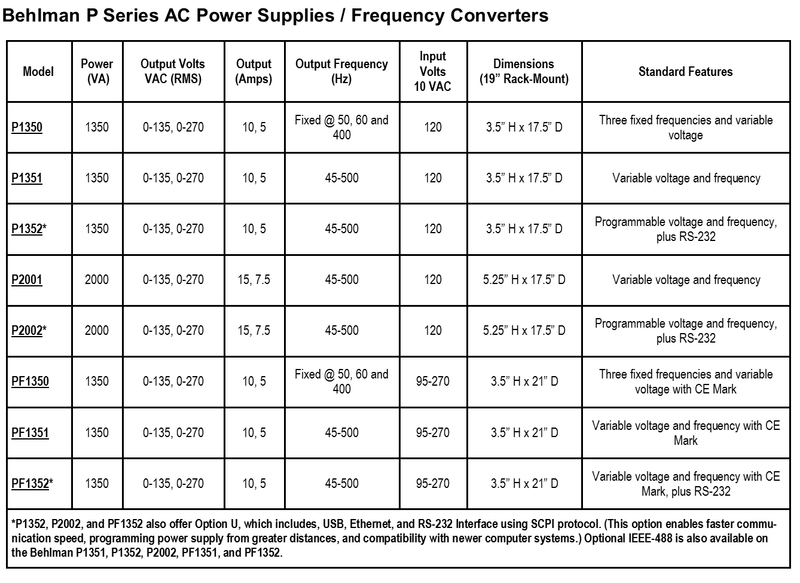 The PDF comparison chart attached to this news release provides key data on the entire Behlman line of P-Series AC Power Sources / Frequency Converters. Complete details and data sheets are immediately available at http://www.behlman.com/products-detail/p-series-ac-power-supply-frequency-converter. Fixed @ 50, 60 and 400 Hz; Input Volts 10 VAC 120; Dimensions (19’ rack mount) 3.5” H x 17.5” D; Three fixed frequencies and variable voltage. 45-500 Hz; Input Volts 10 VAC 120; Dimensions (19’ rack mount) 3.5” H x 17.5” D; Variable voltage and frequency. 45-500 Hz; Input Volts 10 VAC 120; Dimensions (19’ rack mount) 3.5” H x 17.5” D; Programmable voltage and frequency, plus RS-232. 45-500 Hz; Input Volts 10 VAC 120; Dimensions (19’ rack mount) 5.25” H x 17.5” D; Variable voltage and frequency. Model P2002*; Power 2000 VA; Output VAC (RMS) 0-135, 0-270; Output Amps 15, 7.5; Output Frequency 45-500 Hz; Input Volts 10 VAC 120; Dimensions (19’ rack mount) 5.5” H x 17.5” D; Programmable voltage and frequency, plus RS-232. Model PF1350; Power 1350 VA; Output VAC (RMS) 0-135, 0-270; Output Amps 10, 5; Output Frequency Fixed @ 50, 60 and 400 Hz; Input Volts 10 VAC 95-270; Dimensions (19’ rack mount) 3.5” H x 21” D; Three fixed frequencies and variable voltage with CE Mark. Model PF1351; Power 1350 VA; Output VAC (RMS) 0-135, 0-270; Output Amps 10, 5; Output Frequency 45-500 Hz; Input Volts 10 VAC 95-270; Dimensions (19’ rack mount) 3.5” H x 21” D; Variable voltage and frequency with CE Mark. Model PF1352*; Power 1350 VA; Output VAC (RMS) 0-135, 0-270; Output Amps 10, 5; Output Frequency 45-500 Hz; Input Volts 10 VAC 95-270; Dimensions (19’ rack mount) 3.5” H x 21” D; Variable voltage and frequency with CE Mark, plus RS-232. *P1352, P2002, and PF1352 ¬also offer Option U, which includes, USB, Ethernet, and RS-232 Interface using SCPI protocol. (This option enables faster communication speed, programming power supply from greater distances, and compatibility with newer computer systems.) Optional IEEE-488 is also available on the Behlman P1351, P1352, P2002, PF1351, and PF1352. WHY AN AC POWER SOURCE/FREQUENCY CONVERTER IS ESSENTIAL. During the development and testing of military, industrial and consumer products, if the product to be tested is plugged directly into any standard factory AC main, there is a possibility that the power being used could corrupt the test. This can affect the performance of the equipment being tested, causing its functionality to appear be on-spec, when it is off -spec, or off-spec when it is on-spec. Either way, such false test results can be costly due to the need for additional engineering to fix a non-problem, or worse, the cost of having to fix faulty units in the field, thus losing customer confidence. A regulated electronic AC power source/frequency converter can solve this and many other power quality issues, while providing additional testing flexibility. Behlman Electronics Inc., (http://www.behlman.com), a subsidiary of Orbit International Corp., manufactures and sells high-quality standard, modified-standard, custom and COTS power solutions, including AC power supplies, frequency converters, inverters, DC-DC, AC-DC, DC-AC, uninterruptible power supplies, and tthe VPXtra® line of VPX/VME Power Supplies. The Behlman PF1352 provides clean power with microprocessor control. It has a vacuum fluorescent display and fully adjustable voltage and frequency. Compare all Behlman P-Series AC Power Sources to find those best suited for your applications. Compare all Behlman P-Series AC Power Sources to find those best suited for your applications.